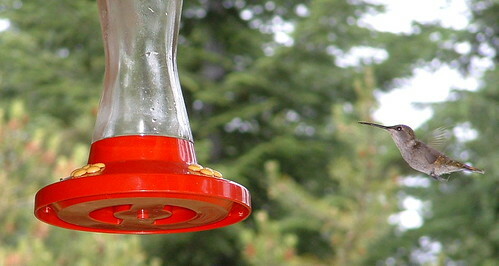 Here are a few photos I shot today of some hummingbirds that were feeding off my feeder. Don’t worry if it looks empty as I am using clear juice for them and it’s just below the red rim so you can’t see the juice line. These birds just love my homemade hummingbird juice. This is the second year that I have been making up my own home brew for them. Here is the link to my homemade hummingbird juice recipe that I posted last year. I actually had 3 birds drinking all at the same time but couldn’t get a picture of them. They move so fast that by the time I try and click the picture, they have moved. Here is a great shot showing the beautiful back of this hummingbird. She’s just so pretty with her yellow spots. Another photo of the same bird drinking from my hummingbird feeder.